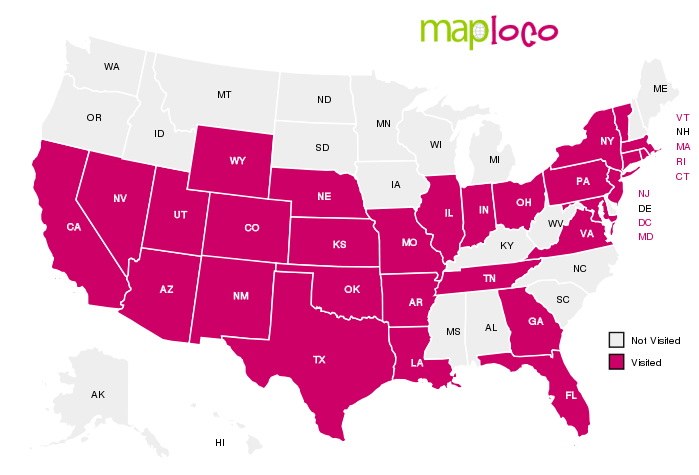 It has long been one of my life goals to visit all 50 states. My grandparents did it. They drove in a Volkswagen Van in the 90's and finished up their list. They made their trek before cell phones and GPS and online reservations - they were both in their 70's at the time to boot! Two years ago I was presenting at a conference and we took the family and drove from Texas to Boston, Mass and it was amazing. It was a rock star trip, different hotel every night kind of trip. Our children were able to see and do so much; it would have taken years to do it any other way. There is an All 50 Club to recognize those who have visited all 50 states. A great debate has been, "What Counts?" and there are some who want to run marathons in all 50. There are some who say airports don't count some think that you have to stay the night in a state for it to count. I love the idea of seeing all of America. Connect with Explore All 50. They even have a newsletter and are on social media. I bought the Let's Go See All 50!, Visiting the 50 States Journal to help me keep track of what we have left. It's so easy to fill out and even has a page to color in all the states you've been in.